Did you know that Trump has appointed a commission to look into voter fraud? 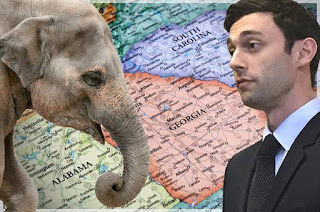 I'd like to see that committee look into Georgia's special election runoff tomorrow between Democratic newcomer, Jon Ossoff (49 percent), and former Republican Secretary of State Karen Handel (19.8 percent). This special election should not have been necessary because Ossoff - who maintained totals above 50 percent throughout the race was robbed. Fulton County officials admitted that a "rare error" was made that "might have cost Ossoff the race." That error allowed Karen Handel the former Republican Secretary of State to challenge Ossoff in a one-on-one election. Can you believe that? But wait. There's more. Georgia is one of five states that has major problems with unverifiable election results. All of these states use touch screen machines (DREs) and have no paper trail. The DREs should have been consigned to the junkyard a decade ago according to computer experts throughout the country. The rest of the states caught on to the many problems with DREs and have moved on to safer voting systems. Why are these states - New Jersey, Delaware, Louisiana, South Carolina and Georgia stuck in the caveman days of computers? In 15 states, including the swing states of Florida, Pennsylvania and Virginia there are counties that, like Georgia, who use touch screen machines with no paper ballots. If these counties were to be targeted by hackers in an election, the shifting of a few votes per precinct could change the results of a race. A perfect example of that was Trump's win in Wisconsin, where he won by less than 23,000 votes. Wisconsin has 3,700 precincts. It would only take a difference of seven votes per precinct to change the state's outcome results. Barron's testimony, along with the advice of both local and national computer experts, show the results of the first round of the election on April 18th was legitimately suspect and that no election running on this type of computer system can be verified as accurate. The outcome of tomorrow's special election is crucial to both parties. It's also crucial to democracy that it be a fair election. Perhaps the question we ought to be asking is, why are these states and counties lagging so far behind in election technology? Meanwhile, I'm taking bet's Trump's new commission on voter fraud skips the Georgia election while in pursuit of illegal aliens voting a dozen times each in the last election.